STAMFORD, Conn., April 25, 2018 – Arccos Golf today announced the expansion of its capabilities to further grow the connected golf space through an agreement to license Cobra Golf patents related to the incorporation of data tracking sensors into a golf club grip. Recently named one of the “World’s Most Innovative Companies 2018” by Fast Company, Arccos’ latest move follows the Q1 2018 launch of golf’s first smart set, the Cobra KING F8 line with Cobra Connect Powered byArccos, which boasts an Arccos sensor embedded in the grip of every club. Available for iOS and Android, the Arccos platform combines automatic data capture and advanced analytics to help golfers of all skill levels make smarter decisions and shoot lower scores. In 2017, Arccos users lowered their handicap by an average of 3.55 strokes – a rate that’s 46.7x faster than the average player with a USGA handicap. Facilitating that dramatic user improvement was last year’s introduction of golf’s first artificial intelligence platform, Arccos Caddie. Developed in partnership with Microsoft, Arccos Caddie shows a player their optimal strategy on any hole in the world. Its AI engine is fueled by golf’s richest data set, which includes over 100 million shots hit during 750,000+ rounds played by the Arccos community, and 418 million GPS mapping data points on 40,000+ courses worldwide. Arccos Caddie also considers a player’s personal shot history, course elevation, weather conditions and other factors. It was recently declared Permitted Under the Rules of Golf, according to USGA decision #2017-0754. “Arccos is invested in building and refining the sensor technology, advanced analytics and artificial intelligence platforms that we’ve brought to consumers through Cobra Connect technology in the grip of our Cobra KING products. We believe the insights players gain about their games through this technology will make them smarter, better golfers,” said Mike Yagley, Sr. Director of Innovation / AI at Cobra Golf. It was honours even as the combined talents of Rory McIlroy & Paul McGinley and Padraig Harrington & Shane Lowry cut the ribbon on The Golf Course at Adare Manor, set to quickly become one of the world’s most celebrated layouts. With each pair returning a four-ball better ball strokeplay total of four-under-par 68, the match was witnessed by 1,500 spectators and marked the official opening of the wholly reconstructed Tom Fazio-designed championship course at Adare Manor. As a result of their joint success, each pair will donate €250,000 to their chosen charities, including The Rory Foundation, The McGinley Foundation, Temple Street Children’s University Hospital and the Padraig Harrington Charitable Foundation. Following the match, the players were quick to praise the quality of the golf course, which will now be fully open for play among members and guests, and complement the recently refurbished Manor House. One of the most significant developments in Irish golf in recent years, the Exhibition Match drew much attention from global media, who earlier attended a press conference where it was announced the high-profile JP McManus Pro-Am will return to Adare Manor in 2020. 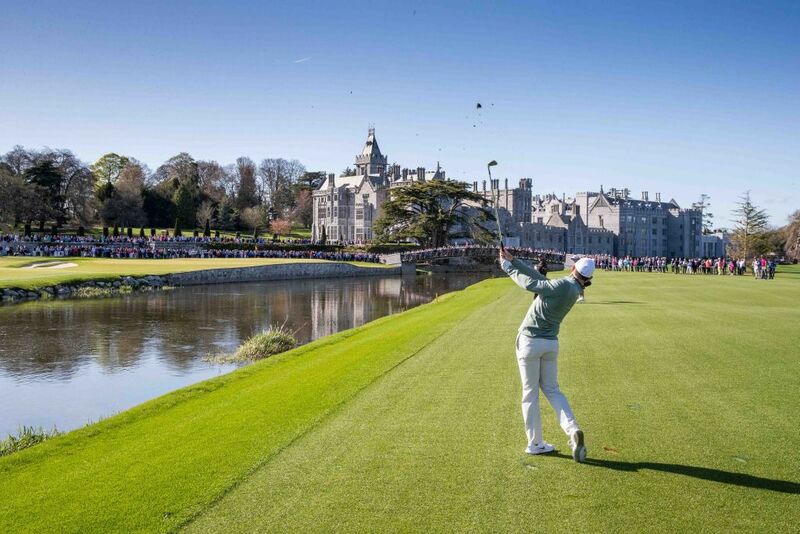 The star-studded occasion, which has previously attracted the likes of 14-time Major winner, Tiger Woods, and World No.1, Dustin Johnson, and raised over €100 million for charity in five previous editions, will take place over The Golf Course at Adare Manor from 6-7 July 2020. Following a two-year reconstruction commissioned by the ownership of the Adare Manor resort, the McManus Family, The Golf Course at Adare Manor is now open to the golfing world. In bringing to life the 7,509-yard championship layout using practices and products like no other in history, the Fazio Design team has established a course capable of hosting the world’s most prestigious golfing events. Colm Hannon, Chief Executive Officer of Adare Manor, said: “The Exhibition Match to officially open The Golf Course at Adare Manor has been a huge success and we owe a great deal of thanks to each of the players – Rory, Padraig, Paul and Shane – who have made this such an entertaining and memorable day for all of our guests. 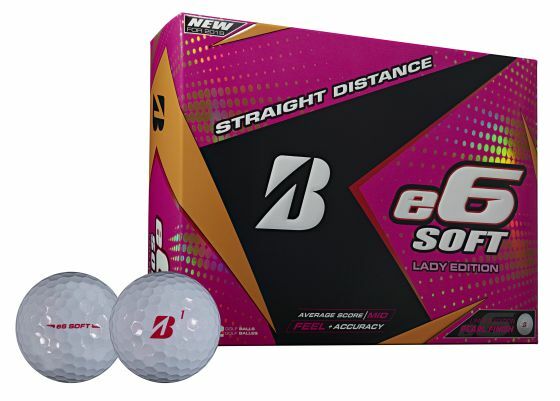 (COVINGTON, GA) – Bridgestone Golf – innovator of premium golf balls, clubs and accessories – unveils the e6 SOFT Lady Edition, featuring a pearl white finish and pink Bridgestone marking, side stamp and packaging. The new model is available now at www.bridgestonegolf.com and select retailers nationwide. The e6 SOFT is among the most popular models in the company’s extensive catalog. It is designed as a high-performance ball with soft feel that produces incredibly straight distance by lowering side spin in drivers and long irons. Control and touch around the green are excellent thanks to advanced mantle and cover properties, while distance and accuracy are further enhanced because Delta Dimple Technology minimizes air resistance. The e6 series, consisting of the e6 SOFT and e6 SPEED, is designed to help players find the fairway more frequently in order to set up scoring opportunities. They are ideal for mid-level golfers seeking outstanding performance in a variety of areas. While both are engineered to provide accuracy by reducing side spin, the e6 SOFT caters to players seeking a specific feel, while the e6 SPEED is built for distance. Beyond the e6, Bridgestone Golf designs a diverse portfolio of golf balls to meet the needs of all players, including the TOUR B X, TOUR B XS, TOUR B RX, TOUR B RXS, Extra Soft and Lady. More information on the company’s ball, club and accessories offerings are available at www.bridgestonegolf.com. 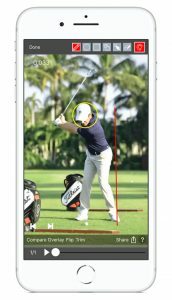 BFIT Golf Ball Fitting App – Free to download, the app turns the iPhone into a mobile launch monitor by utilizing the camera to analyze the user’s swing and recommend the best Bridgestone ball for his or her game. New Online Fitting Tool – Available at www.bridgestonegolf.com, it accommodates the full spectrum of players. The “Quick Fit” option easily determines the best ball for novices while the in-depth “I Know My Game” presents detailed questions to assist experienced golfers to find the perfect fit. The “I’ve Been Measured” path allows users to input launch monitor data, ensuring the most accurate recommendation possible. Bridgestone Golf’s professional staff includes 14-time Major Championship winner Tiger Woods, FedExCup champion Brandt Snedeker, Olympics bronze medalist Matt Kuchar, Masters winner Fred Couples, rising stars Bryson DeChambeau and LPGA stars Lexi Thompson and Cheyenne Woods. 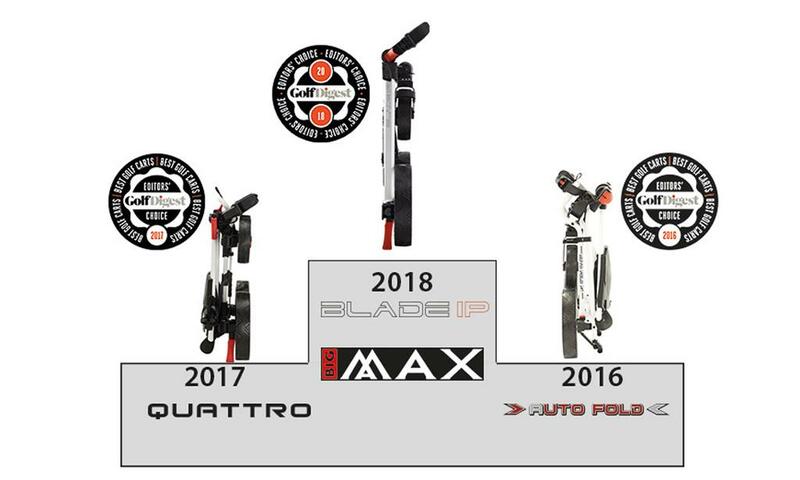 BIG MAX, Europe’s No.1 push cart brand is celebrating a Three-Peat of accolades in the Golf Digest Editor’s Choice Award for ‘Best Club Transport – Push Cart,’ with the new BLADE IP push cart taking the 2018 title. Following the success of the AUTOFOLD FF in 2016 and BLADE Quattro in 2017, the BLADE IP had a lot to live up to. But with an advancement in BIG MAX Fold Flat technology and addition of innovative new features, the BLADE IP impressed the Golf Digest editors and delivered the recognition that had been earned by its game changing predecessors. The success of all three of BIG MAX’s award winning carts is based around the folded size. And with the BLADE IP coming in at a just 34 ½” x 24 ½“ and an incredible depth of less than 5” it is the Flattest of the BIG MAX carts and hands down, the most easily stored and transported push cart on the market. The BLADE IP is as practical on the fairways as it is for transport and storage. Multiple features such as double foot brake, integrated drink holder and storage compartment in the handle, along with ball, tee and double scorecard holder, keep all a golfers’ necessities close to hand. Multiple Quick Lok and Quick Fix bases finish the package, ready to take any BIG MAX accessory such as umbrella holder, GPS holder, or sand bottle holder. When the BLADE IP hits the stores in May, it will be the latest in the line of Game Changing Carts from BIG MAX and following this endorsement from Golf Digest is set to get more U.S. golfers walking the course than ever before. (Montalcino, Italy – April 4, 2018) The Club at Castiglion del Bosco, Tuscany, has announced the inaugural Weiskopf Invitational, a new golf event to be hosted by former Open Champion and acclaimed course architect Tom Weiskopf. The exclusive two-day event will mark the 45th anniversary of Weiskopf’s Open victory, one of five titles he won during an extraordinary season that elevated him to among the top three players in the world. It will also serve as a homecoming to Castiglion del Bosco, Weiskopf’s only course design in Continental Europe and regarded as a landscape masterpiece. The Weiskopf Invitational is one of a series of exclusive international golf and wine events around the world hosted by Castiglion del Bosco’s founders and proprietors, Massimo and Chiara Ferragamo. Tom Weiskopf said: “It’s an honor to be hosting this event and I am very much looking forward to returning to Castiglion del Bosco, playing some golf with the members and spending time with my wife, Laurie, in what is one of the most beautiful places in the world. 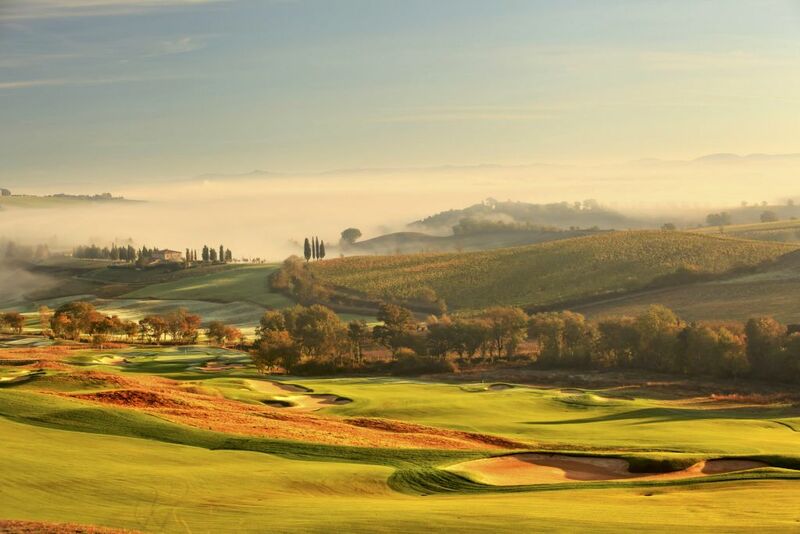 The Club at Castiglion del Bosco is Italy’s only private golf club, offering members Europe’s finest golf and wine experiences, including privileged access to the estate’s winery, producer of prestigious Brunello wines. Golf and wine go hand-in-hand at Castiglion del Bosco and the golf course includes a short 19th challenge hole, The Brunello Hole, where members play for a Magnum of Brunello before retiring to the clubhouse. The Weiskopf Invitational will take place May 18-19, 2018. Ann Arbor, MI – V1 Sports (V1), producers of the leading golf video instruction technology platform for teaching pros and golfers, has released a new V1 Golf IOS App and it is receiving rave reviews from golfers across the globe. Founded in 1995, V1 Sports (V1) is the leader in video swing analysis software. The V1 Golf game improvement platform delivers golf instruction by connecting golf professionals and golfers to improve performance. V1 is recognized as the pioneer in delivering seamless video lessons with integrated telestration and voiceover. V1 products capture, review and analyze swing video for the creation and sharing of golf lessons and instruction content. To date V1 has delivered over three million internet video lessons by its more than 6,000 PGA golf professionals, including many Top 100 instructors. V1 Pro HD software is used by the most respected coaches, instructors, athletes and training facilities around the world. The V1 Golf App also enjoys worldwide leadership among consumers as evidenced by millions of downloads. In 2016 and 2017 Golf Digest ranked V1 the No. 1 Video Analysis Software in its category. Visit www.v1sports.com. Follow V1 on Facebook at https://www.facebook.com/V1Sports and on Twitter @v1sports. Indian Wells, Calif. – NextLinks, one of the golf industry’s hottest trends in the effort to grow participation through fun-based accessibility at non-traditional venues, is pleased to announce its strategic involvement in the “Shot in the Dark” nighttime golf experience which recently broke ground at the award-winning Indian Wells Golf Resort (Indian Wells, Calif.). The complete “Shot in the Dark” experience at Indian Wells– which is on pace to debut with a soft opening in late April/early May — will include music, a full-service outdoor bar, a chef-curated food truck operation and a driving range adorned with 20-ft inflatable, glow-in-the-dark targets that react with lights and sound effects when struck by glow-in-the-dark golf balls. NextLinks announced its presence as a key player in the “alternate golf experience” arena by showcasing its groundbreaking indoor/outdoor golf technology and business concepts at the recent PGA Merchandise Show. The golf experience is driven by proprietary software that seamlessly blends golf simulator play with realistic short game shots and putting on expertly-designed artificial putting greens, as well as outdoor venues on real putting surfaces. Indian Wells general manager Steve Rosen is anxious to see what expanding the concept of “golfable hours” will do for the bottom line at the famed 36-hole golf property. “We expect this new ‘entertainment zone’ to become a major nighttime attraction for the resort and the entire Coachella Valley, not just golfers and guests at Indian Wells,” Rosen says. Players will be able to choose to play NextLinks-powered games (by the hour) from a touch-screen menu then play them on the real-grass Putting Course. For more information on this project, visit www.nextlinks.com and http://www.indianwellsgolfresort.com/. In the Spring of 2015, David Shultz, a veteran technologist, followed his passion for golf and began working to realize his vision for NextLinks and REALiTEE Golf, immersive golf experiences designed to make golf accessible to beginners as well as seasoned golfers. Shultz spent more than two decades as an electrical engineer and operations executive at General Electric. As an aviation electronics technician in the United States Navy, Shultz discovered a knack for problem solving on the avionics systems of A-6 and F/A-18 aircrafts. The seasoned technologist was also a key team member on the Boeing 787 development project while at General Electric. 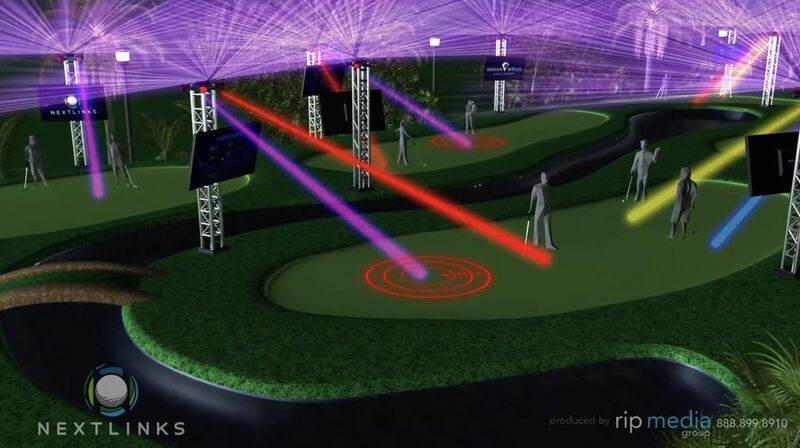 NextLinks is a fully scalable business opportunity meaning venue owners with 850 square-feet of space up to 100,000 can license this unique golf entertainment platform and develop a fun alternative golf experience. Using proprietary software that seamlessly blends golf simulator play with realistic short game play and putting on expertly-designed putting greens, NextLinks revolutionizes indoor golf for participants of any skill level. Visit www.Nextlinks.com. Follow Nextlinks at www.facebook.com/NextLinksGolf as well as on Twitter and Instagram: @nextlinksgolf. Join the DoubleTree Resort by Hilton, Myrtle Beach Oceanfront on Tuesdays at 10:30 a.m. (EST) for TeeTime Tuesdays on Facebook LIVE (@DoubletreeMYR). We’ll spend 10-15 minutes showcasing top-rated area courses, chatting about golf trends and covering what’s happening on the Tour. Considered by many as the golf capital of the world, Myrtle Beach offers exceptional play at a multitude of championship courses for players of varying skill levels. The DoubleTree Resort by Hilton, Myrtle Beach offers overnight hotel guests golf privileges at 27 of the most desirable, difficult and scenic courses in the area. NEW YORK (April 4, 2018) – Pitchfix, the global market leader in switchblade divot tools, announced its Fusion 2.5 was named “Best Divot Repair Tool” by Golf Digest in its 2018 Editors’ Choice Awards for the second consecutive year. The Fusion 2.5 makes ball mark repairs easier for golfers and continues to help reduce pitch mark repair damage to greens. Pitchfix’s patented technology featuring a pronged metal retractable system out performs all other divot repair tools. Like all other Pitchfix products, the Fusion 2.5 is highly customizable for promotional gifts and corporate branding. Currently, Pitchfix products are available at many top U.S. retail outlets such as PGA Tour Superstores and green grass pro shops. For more information please visit www.pitchfixusa.com. Among the features offered in the Fusion 2.5 are ABS rubberized handle for soft touch and grip, removable one inch ball marker, built in pencil sharpener, specifically designed for those small diameter golf pencils and broken tees, and 14 color options. Founded in 2005, Pitchfix is the market leader for switchblade divot tools and other golf related products in Europe and Asia. It is renowned for its high standards in design and product quality. It aims to be the market leader in divot tools and other golf related products in the United States by designing, manufacturing and distributing an ever-growing line of high quality and innovative European designed products through selected U.S. distribution partners. Pitchfix currently offers an array of diverse and innovative products for golfers worldwide: Fusion 2.5 Divot Tool; Fusion Single Pin Divot Tool; Original Divot Tool; Twister 2.0 Divot Tool; Classic Divot Tool; Hybrid Divot Tool; XL 2.0 Divot Tool; Alignmee Marker Alignment Tool and Hatclip Ball Marker. Pitchfix currently has operational and manufacturing facilities in Hong Kong, China, the Netherlands and the U.S. In the U.S. the company recently opened three fulfillment centers with five customer facing/support employees to facilitate custom order processing and fulfillment. Custom orders are fulfilled within two to eight days of receipt. For further information go to www.pitchfixusa.com.